Following an exhaustive search process which began in May, the Hyde County Board of Education today approved the contract of Superintendent-Elect, Stephen Basnight III to replace retiring Dr. Randolph Latimore, Sr. who has served the school district for the last decade. Mr. Basnight was selected from approximately thirty applicants for the position. 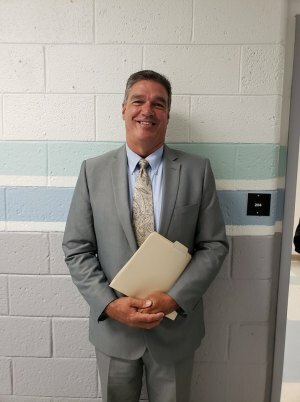 Mr. Basnight has served in a variety of positions from teacher, coach, Assistant Principal, District Curriculum Specialist and Principal in Dare County and most recently as Principal of J. P. Knapp Early College High School in Currituck County. Additionally, he has achieved recognition as a National Board for Professional Teaching Standards Distinguished Teacher and additional degrees of: (EDS) Education Specialist, Master of Arts in School Administration and Bachelor of Science from East Carolina University. Under his leadership his schools have received recognition for academic performance and extra-curricular successes in both sports and academics. His current school has been recognized as a State Performance Grade of “A” and for exceeding expected growth for the last four consecutive years. Equally important the school was recognized in 2017 and 2018 as “One of the Nation’s Best High Schools” by U. S. News and World Report. He has been described as “innovative, dedicated, collaborative, competent, respected and always prepared and whose decisions and actions are driven by what is in the best interest of students”. Others cite his “exceptional work ethic, ability to empower employees, bring consensus to issues and the support and accolades of different constituent groups as other attributes.” Thus, the Hyde County Board of Education is delighted that he has agreed to accept its offer to lead the school district. Mr. Basnight will assume his duties on October 27th upon the retirement of Dr. Randolph Latimore.